I saw a Moldy Chum post on this new technology called Animoto and decided to investigate. 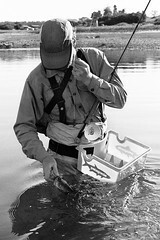 I went to the Animoto website and discovered that this technology could be a fun tool for the photo rich activity called fly fishing (though it's not really marketed toward it). It was relatively easy to use, especially if you have an image database on Picasa, Facebook, Flickr or Smugmug. What is Animoto? "It's newly developed Cinematic Artificial Intelligence technology that thinks like an actual director and editor. It analyzes and combines user-selected images and music with the same sophisticated post-production skills & techniques that are used in television and film." Who is Animoto? "A bunch of techies and film/tv producers who decided to lock themselves in a room together and nerd out." Here's a 30 second clip of images I combined with Animoto technology. It's called Bluefin. I really liked the animoto video piece you did. Why not upload it to the Hook.tv site? Have you created a profile there yet? Love your blog by the way.